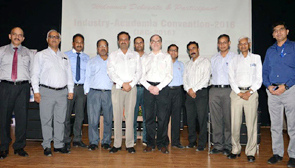 A mega event 'Industry Academia Convention 2016 (IAC-2016)' was organized on April 22, 2016 by ?‎ICEIT Student Chapter and Technology Incubation and Development (TID) (a multi-domain facility for development and service provisioning) @ Department of Electronics and Communication Engineering, ?‎GLBajaj. The event endeavored to throw light on some of the indispensable skills – technical and behavioral, necessary to thrive in a corporate ambience and find actionable solutions to line up corporate expectations with technical education. Exposure to real time industry applications and methodologies is required through direct interaction of industry and academia. • Keynote talks delivered by experts from industry to discuss major high impact technology and innovations prevalent in industry. • Interactive panel discussion to discuss challenges faced by industry and academia towards availability of industry ready professionals. • Suggested models of industry – academia collaboration and solutions to common impediments that arise during the process. • Exhibit of technology/products/solutions by students, innovators, researchers and industry professionals. • Mr. Subhankar Ghose, Head, HR, ?‎ABPNewsNetwork Pvt. Ltd.
• Mr. Prakash Kumar, Head HR, Autometers Alliance Ltd.
• Mr. Anup Gupta, Country Head, Customer Service, Autometers Alliance Ltd.
• Mr. Ravi Kant, VP, ?MothersonSumi Infotech & Design Ltd.